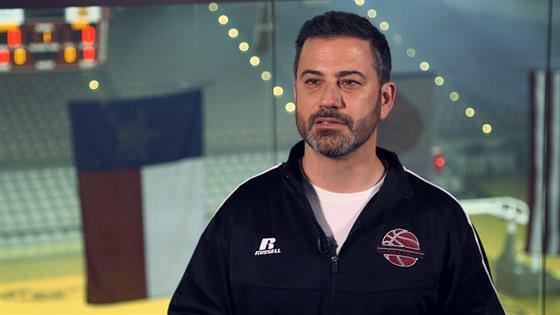 Jimmy Kimmel and Ted Cruz may not agree politically, but they do agree on supporting deserving causes. Over the weekend, the late-night host and United States Senator came together in Texas for a charity game titled The Blobfish Basketball Classic. Before the match airs tonight during Jimmy Kimmel Live!, E! News sat down with the pair to discuss the charitable cause. For Jimmy, helping sick children is a personal cause after his newborn son had heart surgery at Children's Hospital Los Angeles. "My son is doing great. He's the reason that we are supporting Texas Children's Hospital here in Houston," he shared with E! News. "We were at Children's Hospital in L.A. and they work together and do great things together and so it seemed like a good idea to raise money for them while we're here." Jimmy continued, "When you do something like this, I think it's always the right thing to try and do something good along with it. Yah, we're having this game. It's relatively meaningless, but what is meaningful is the fans who have donated money to our charities and Ted and I will be donating." As some viewers may have noticed, the television host has not shied away from discussing politics on his late-night show. While some people "don't like it all," Jimmy says he can't help but speak out about certain causes affecting Americans. "The reason I've gotten more political on my show is it's almost like saying, 'You seem more panicky since your house went on fire.' Because things are going so badly, you can't just stand by and not say anything about it," he explained to us. "If you love your country, you have to say what you believe in and you have to speak up about the things you think are wrong." "And there's just this hail storm of things that are wrong happening not just every day but multiple times everyday and I feel like I have no choice but to talk about that stuff," he added. Before we watch the match-up tonight, witness Jimmy and Ted playfully trash-talk each other in the video above. Jimmy Kimmel Live! airs weeknights at 11:35 p.m. on ABC.